You guys. Every piece in this wedding invitation suite from Ilana of Sugar & Type was individually hand painted. Each and every one! These beautiful navy and silver hand painted wedding invitations were created for the wedding of Ilana’s sister Danielle, who just also happens to be an artist. Danielle viewed the creative process behind these invitations as a symbolic representation of a new marriage, and her description of the process below is just so beautiful I can barely stand it! 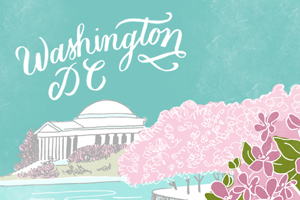 From Ilana: I’m so excited to share my sister Danielle’s wedding invitations! As an artist, my sister really wanted to have her hand in the creative process of the paper goods for her wedding day. My sister and I letterpress printed the invitations on a Vandercook letterpress (with the help of Amy at Green Girl Press), then Danielle individually hand painted each and every invitation, reply card, program, and info card. These invitations truly told a unique story. Danielle and Andrew’s winter wedding was held at an art gallery, where people were able to explore the space and really appreciate the art! 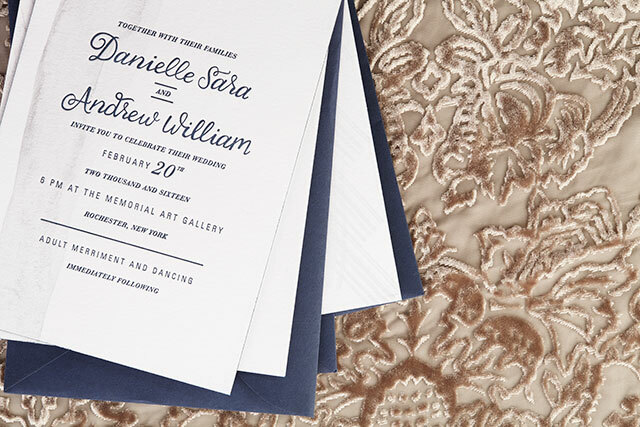 The invitations were printed on 220lb paper with navy edge painting. Each envelope was hand addressed with silver ink to match the hand painted element on the suite. They carried out the metallic splatters throughout the details at their ceremony and reception, and it was truly a masterpiece. From Danielle – the bride and artist: For our wedding, it was important to us that the experience of art was gently portrayed in every element. From the hand painted brush strokes on each piece of every invitation, response card, information card, and program, to the calligraphy that was letterpress printed onto each sheet of paper. The brush strokes represented the evidence of process, the way that every motion in life leaves a mark, either large or small. These strokes were intentionally made to be perfectly imperfect and one of a kind, just like each individual marriage or relationship. Each mark was made specifically with intention and care, the way that everything you do in a marriage should be. Each component of the creation of the invitations reflected the ever changing atmosphere that exists in a marriage and fulfilled the symbolic process that felt necessary for us as we embarked on our next journey as a couple. We are thrilled with what the process yielded and the final product truly represents us as a couple. We are a team who tries to take time to consider the purpose and execution of our actions, and works to enjoy the journey to the final product. Check out the Designer Rolodex for more tal­ented wed­ding invi­ta­tion design­ers or visit the real invitations gallery for more wedding invitation ideas!